The building of Marymead Shopping Centre in Broadwater Crescent was completed in 1957. 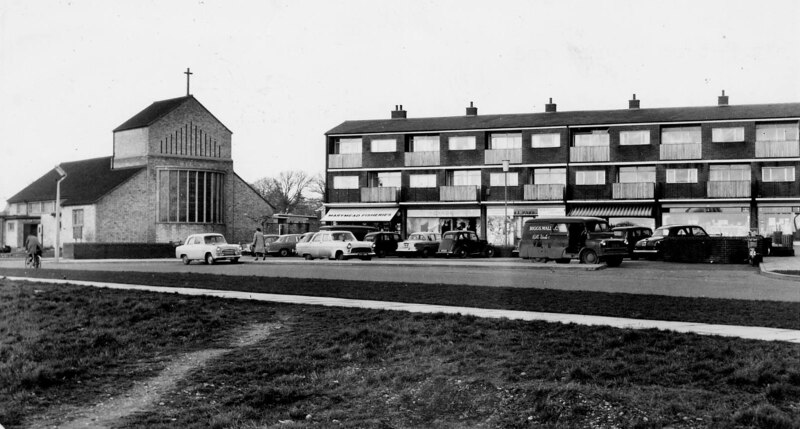 Building of the neighbourhood of Broadwater began in 1953, so the residents had quite a wait for their local shops to be completed! After much protest, temporary shops were set up in the ground floor of the houses 299 to 309 Broadwater Crescent. There was also a Co-op caravan situated opposite, and some local traders came round regularly in vans to deliver goods to the residents. When the new shopping centre opened in 1957, the 6 temporary shops moved into new shops in the shopping centre and the houses were returned to their original use. Do you remember the temporary shops? Can you tell us what they were? Yes. The fish and chips were exceedingly good. Pity about everything else! My Mother used to bundle us kids up and drag us across the corn fields south of the town to do her shopping in Knebworth Village. People were definately made of tougher stuff back then. The one thing I remember about Marymead Shops was the café, frequented by many of the youngsters in the area during the 60’s. I think it was at one time a car showroom – not sure what finally became of it? Also remember the local group “The Sinners” mentioned by Len Crawley who was their drummer. I knew Len during the 60’s. I believe a mutual friend of ours also played for The Sinners – Ricky Payne. Recall them playing a few gigs at the recreation centre in Shephall Park. Farrs the sweet shop was in the original shops that moved to the new Marymead shopping area, thats where the cigarette machine was. The greengrocer was Batemans, Foxes grocer store, Westminster Wine, the Barbers round the back and a toy shop. Spent a lot of time at Maymead. I remeber one of the shops had a cigarette machine outside where you could buy a pack of 5 Bachelors! Cox’s the butchers was in a house in Broadwater Crescent next to Fellows Way,then they moved into Roebuck shops; in Mary mead shops was one shop a café,then car sales?,me and mother walked to Old Town for shopping,had to walk along busy A1,we got some food from Gunners the butchers. i came to Stevenage in the summer of 54 and before the shops and temp shops we had to walk to the old town.i remember John Cochlan who lived at 23,i was at 38 his dad Jock used to cut me and my dad Jimmy’s hair.anybody remember me? Marymead shops… great fish & chips. Used to cycle up the hill from Broad Oak Way and then cycle like crazy back to eat them warm from the newspaper!! Vague recollections of the coffee cabin. My elder brothers used to take me and my sister up there for “frothy” coffee. The Church St Peter’s… where I was baptized!! I used to live in Holly Leys so I used the temporary shops. All I can remember is Pearce the bakers, greengrocers and the Ironmongers - they relocated to the Marymead shops. Before the co-op caravan which was opposite the shops we had mobile shops - the co-op, Fine Fare, bread van and drinks van which sold spirits and lemonade from a bedford van. I used to work on it.